Sun in Cancer from 21st June – Summer Solstice horoscope! The Sun is in Cancer from the 21st of June until the 22nd of July, 2018. In the Northern Hemisphere, the Sun in the sign of Cancer is at its zenith in the Summer and shining its brightest light and warmth on us all. As soon as the sun comes out, we all feel better, we are more sociable and life looks more promising. In Astrology, the Sun determines how we feel and express ourselves. Cancer is the planet associated with emotions, family and home. Thus, Sun in Cancer encourages us all to listen to our true feelings and to connect with our inner selves. When the Sun is in Cancer it can be an emotional time. 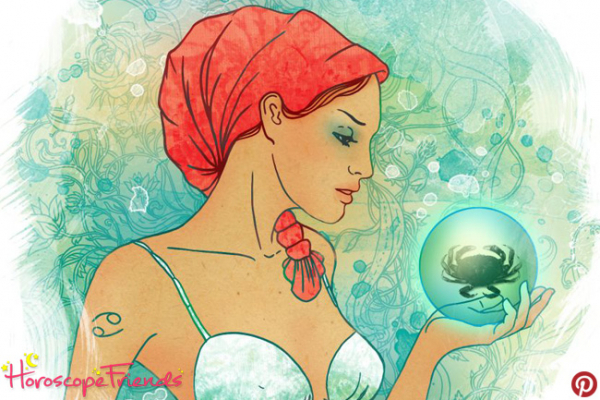 Cancer tends to look back at the past, wants loved ones near and is always trying to nurture and take care of others. Expect to feel more emotional and sensitive, but try not to take everything personally. You might be feeling more vulnerable than usual and crave a need for privacy and alone time. The sun enters family sign Cancer and you might be the one offering someone a comfy base, dear Aries. Your attention will be focused on your home and those closest to you. Give yourself permission to be alone and to enjoy pottering about and doing things around the house. It’s a great time to rest, relax and do some home improvements. Sun in Cancer is one of the best social lubricants you can get, dear Taurus. Have fun! Hedge your bets! This is a good time for communications of any kind. Your written and spoken skills are powerful and it’s excellent for promoting and sharing something you are passionate about. If you want to learn a new language or extend your skills, now is the time to sign up for that course. As you wave goodbye to the sun for another year, you’re naturally reflective, dear Gemini. This is an excellent time to reassess your talents and to discover ways in which you can use them to earn more money. A new business idea can come to you that has real potential for success. Make sure you take practical actions to achieve your financial goals. Your birthday should’ve/will go with a bigger bang! The sun in your sign makes you very popular, dear Cancer. This is your birthday time and should be a period of enthusiasm, greater confidence and new beginnings. Your health and energy levels will be high and you are feeling more positive about the direction of your life. It’s a good time to dress differently or to have a new hairstyle. During this Sun in Cancer you’re pretty much gifted the gentle touch, dear Leo – well more ‘iron fist in velvet glove’, and you’re especially good with negative, hypocritical or difficult people. This is a great time to get in touch with your passion. Are you living your dream? If not, what would you love to do? This is a wonderful time for exploring different options, for enrolling on a course, for going on a seminar, for researching possibilities. You’ll be pleasantly surprised! This is a good time for socialising and for getting together with friends. You may want to get involved in some kind of volunteering or doing something positive for your community. Try to join a group that has similar interests and values to yourself and you will feel inspired and emotionally gratified. Discretion in a friendship is more important if you want to hold onto it. This transit focuses your attention on your career and the direction of your life. You may decide to take your career in a totally new direction. It’s a good time for laying down the foundations for your future and for setting new goals. Go for that promotion! Smash that glass ceiling! You can do it, dear Libra! You might need to dress to impress, but please don’t try too hard! Maybe you’ll meet ‘the one’ and decide to marry in Las Vegas? This is a good time for travelling, for enjoying life and for meeting people from many different places and backgrounds. Life will feel lighter than it has for a while. Develop your spiritual side and open yourself up to new experiences. This can be a very positive transit for you. This’ll ignite your wanderlust or increase your thirst for knowledge! You quickly bounce back from hard knocks. It will probably be quite an emotional time for you and expectations of others may have to be released. Try to find ways to release the past so that you can move forward with your life. You may receive a financial gift from someone. It could be an inheritance, a grant, sponsorship or an investment. This is an excellent time to focus your attention on your relationships. Someone new is likely to come into your life and it could be a romantic or a business relationship. You may need to adjust and redefine the boundaries in your existing relationships. This is an excellent time for getting jobs done that need focus and attention to detail. If you have been thinking of going on a new diet to improve your health, this is a great time to get started. You should be feeling in good spirits. During this transiting Sun in Cancer, it’s a great time to start new projects, for doing anything sporty and risky, for working with children and young people. You should feel more alive than ever and you’ll seek new adventures. This is such a delightful time for chasing down your dreams like your life depends on it! Organise a party if the invitations have dried up.